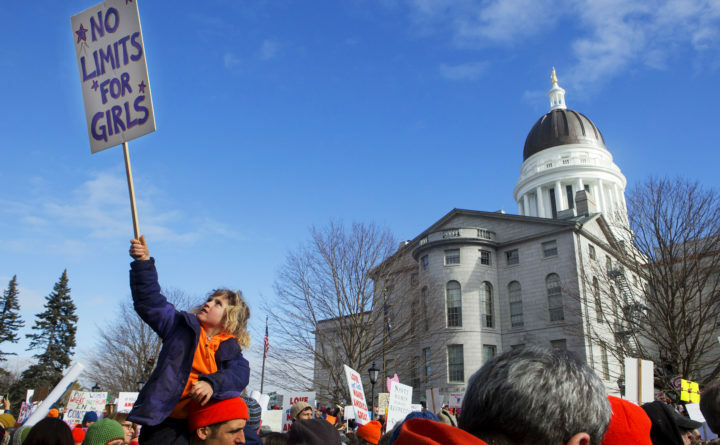 Ada Yentes-Quinn, 6, waves her sign in the air during the Women's March on Maine outside the Burton M. Cross building at the Maine State House in Augusta in January 2017. The national rally was in support of women's rights, civil liberties and protection of the planet. The February 2019 volume of the Journal of Applied Psychology included a major article titled “Gender and the Evaluation of Humor at Work,” which ended with a surprisingly gender-specific caveat. In other words, women who use humor appropriately and well in the workplace will be disparaged, maligned and financially punished for it. Neither men nor other women, according to the findings of this article, regarded humor initiated by women as evidence of intelligence, creativity, insight or leadership despite the fact that those are precisely the positive attributes associated with humor when used by men. I’m shocked, I tell you, shocked. My reaction is exactly like Casablanca’s Captain Louis Renault’s when he finds out there is gambling going on in Casablanca. Let’s just say I’m not exactly surprised. Loud, smart and funny women have always been told we’d be better off if we just calmed down, didn’t show off and acted more like the good girls we were brought up to be. Good girls could demonstrate they had a sense of humor by laughing at jokes made by guys. Only bad girls took attention away from the men, sought attention themselves and made the crowd laugh with them. Good girls, like children, should be seen and not heard, the thinking goes — which makes it hard for women who want to run a business, lead an industry or create an empire (tech, showbiz, or even an actual empire). Usually the person running the show takes the center stage, but if good girls are meant to remain behind the scenes and out of the way, then there’s no place for them in the spotlight. Since the minute we were swaddled in pink blankets, intelligent, ambitious and witty girls have heard that we’re too much. That’s incorrect. The world as it is just isn’t enough. The world’s narrow conventions need changing, not us. The recent study explained that women who used humor were criticized for being “disruptive.” Disruption is what the old systems need. Confining structures and systems must be dismantled to accommodate not only smart, funny women, but other unconventional voices as well. People should not be forced to diminish their talents and strengths in order to squeeze into a miniaturized or abridged version of who we really are — not if the future is going to be better than the past. I don’t want to be misleading: the researchers don’t argue that it’s fair for women to be passed over for promotion, regarded as ineffective leaders or dismissed by their colleagues when they display wit. The American Psychological Association does not, finally, suggest that funny women should be treated as if they are radioactive. That’s the good news. The rest of the good news is that funny women persist. Even if studies show we might be docked pay every time we open our mouths, we’ll keep doing it. Ask a woman who makes deliberate use of her humor in public life — or her private life — whether she’s usually rewarded for it, and watch her laugh. Even if she’s one of the lucky ones — as I am — and has made humor part of her repertoire, arsenal and inventory, she’s had to learn how to do that despite (and not because of) how funny women are treated, characterized and defined. Look, there will always be people who think the word “boisterous” actually has the word “boy” in it. These folks will never want to sit next to a woman who’d make them think, let alone make them laugh. Life being short, they can be left in bliss to watch infinite streaming reruns of the Three Stooges, Jackass and Duck Dynasty, as long as they don’t get in the way of the rest of us. There are a lot of inventive, dynamic and trouble-making women out there who — alongside intelligent and substantial male colleagues, friends and admirers — are eager to make sure that the best lines get the last laugh. Gina Barreca is a board of trustees distinguished professor of English literature at the University of Connecticut and the author of 10 books.